I don’t know Melissa, but I hope her admonition to “Remember” does not fall on deaf ears. And a wish that anyone who might read this has the best possible 2009! I met this guy a couple of years ago. He was just hanging out at Sea World. I thought he was pretty neat looking so I captured his image for posterity. Still not sure what I want to do with this…photoblog…diary…�?traditional blog.�? Guess I’ll just keep posting until it evolves! Great day at the San Antonio Botanical Gardens today. Took the grandkids for one of the last days of the Dinasours in Texas exhibit. It was really well done…models skillfully placed throughout the gardens in settings that make you feel like you are really there. Today also saw the dedication of the restored Japanese Garden. San Antonio and Japanese dignitaries on hand. The garden is wonderful…a great place to spend some time unwinding!! This is my first post ever…no big deal to most, I guess…but it sure is to me. 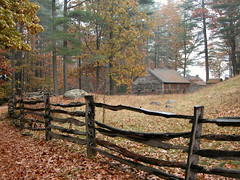 I’m sitting here listening to the rain and feeling the chill and remebering last year’s trip to Massachusetts and Old Sturbridge Village where I took this picture. It means “Fall�? to me! !